Classic goofs and production errors. 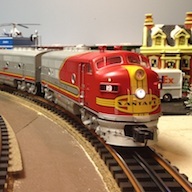 The Sante Fe ‘Warbonnet’ paint scheme is probably the most recognized and most popular ever reproduced on scale and toy trains. With today’s modern production and decorating standards, it’s hard to believe something could go wrong and make it into the hands of consumers. But that’s exactly what happened in 1996 when Lionel released their product 6-18130 Santa Fe F-3 A-B Diesel Locomotives set. This was the first time Lionel offered Command Control in SF F-3 series diesels. This set represents the utmost in body detail from the Post-War era. 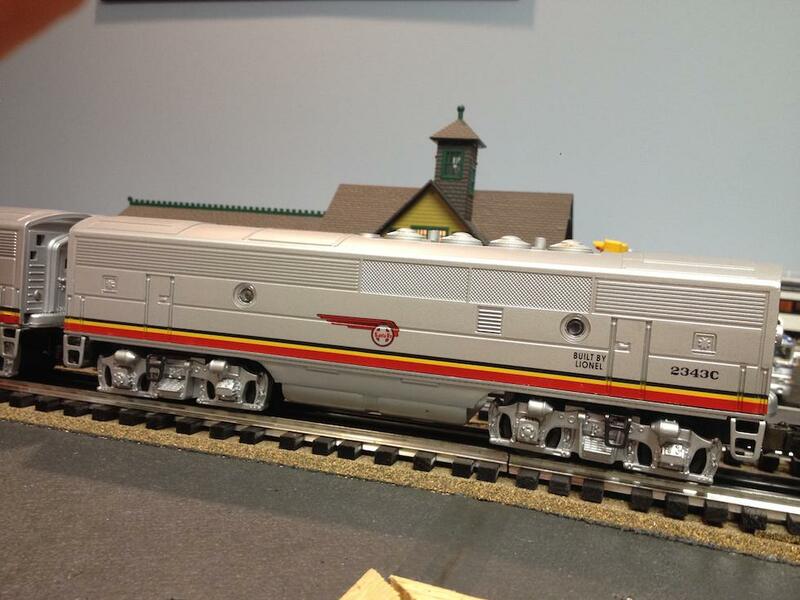 This was also the first time Lionel produced the Sante Fe Warbonnet correctly, with the yellow stripe on the nose going up and over the headlight! Coupling the ‘B’ unit to the forward facing ‘A’ unit properly, the ‘B’ unit will have the 2343C road number at the rear of the unit, and the 4 roof cooling fans should also be towards the rear. 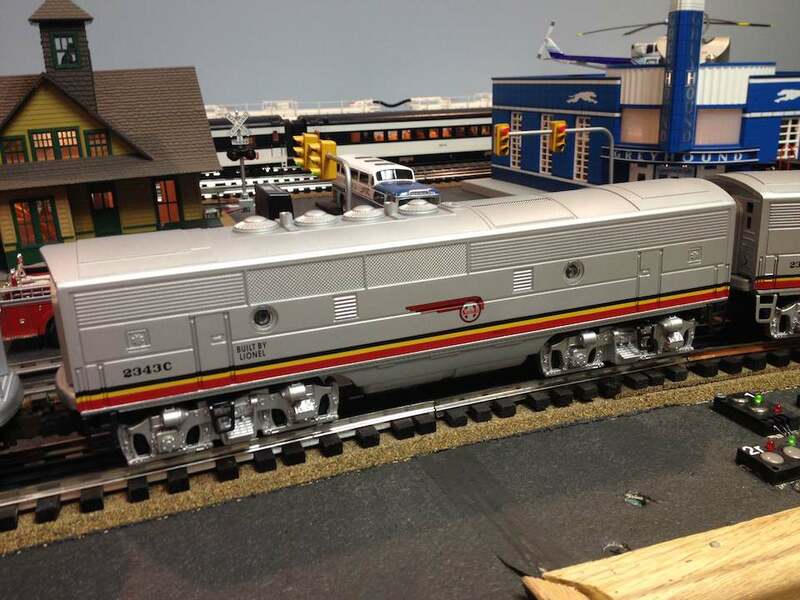 But when doing so, the red ‘Indian Chief Warbonnet’ emblem on the side of the unit is facing the rear, which is backwards! Oops! There’s more ! Neil and I discovered that there’s also versions of Postwar Sante-Fe B units that were also produced with the decals facing what we consider ‘backwards’. And at least some units that were produced with decals facing forward on one side and to the rear on the other. 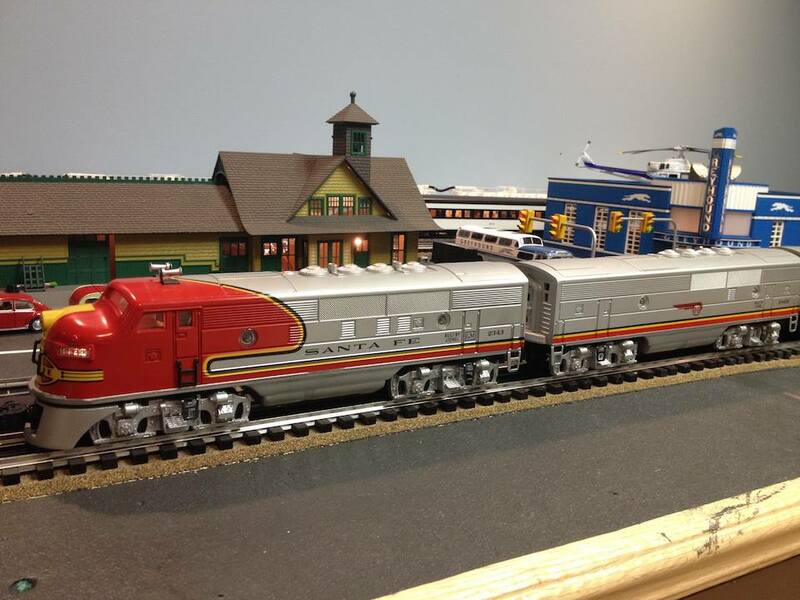 Check out this picture of Neil’s Lionel Santa Fe F3B diesel, #2343C F3B unit from 1951. Note the Indian Chief logo on the left side of the B unit, it has the decal facing the rear. What’s wrong with this picture then ? Looking at the unit from the other side, the decal is facing forward! Who says you can’t have it both ways ? We’re researching more Sante Fe F3B units to see what we discover. Got something to share ? Let us know. 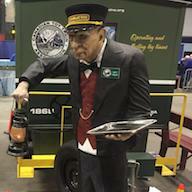 Mike’s Train House invented a new form of rail transportation with their “INTERMOBAL” containers. Yes, look again. 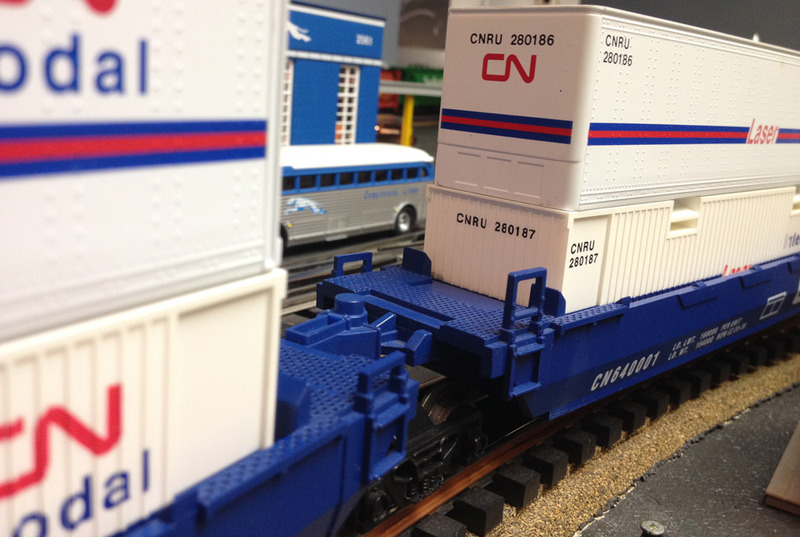 That’s a “B” not a “D” on the side of these otherwise spectacular intermodal Husky Stack CN Laser containers riding in the Canadian National blue well cars. How this one got by the quality guys at M.T.H. is a mystery. Have a look in the 2004 Volume 1 catalog announcing the car, and there it is! ‘INTERMOBAL’. So this production error made it through the print catalog and onto the car. The entire production run is a goof. ‘Missing in action’ CN trailer. 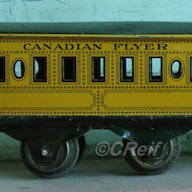 The first ever release of a CN Maxi-stack car came from Lionel. The well cars are painted in GTW blue, and the container stacks are closer to S Gauge. 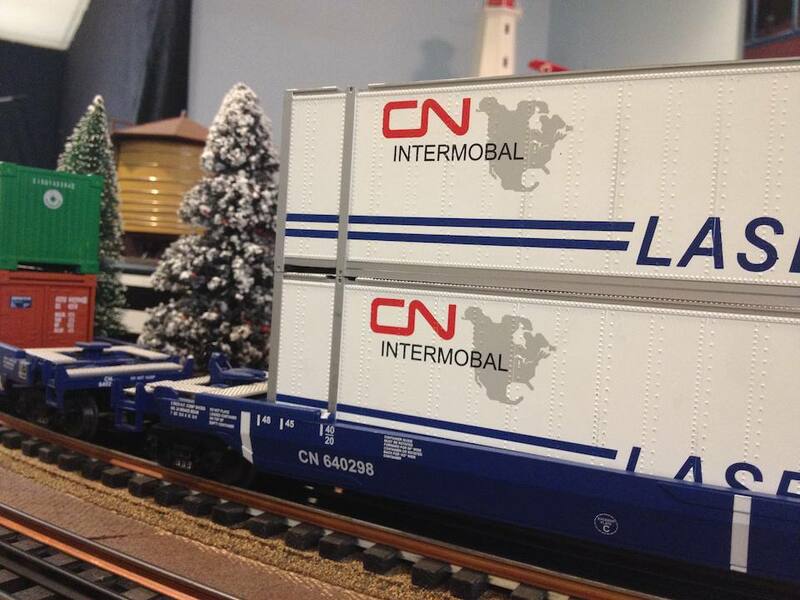 Each of the containers has a CN logo and trailer number leading the way. Well, almost all of them! 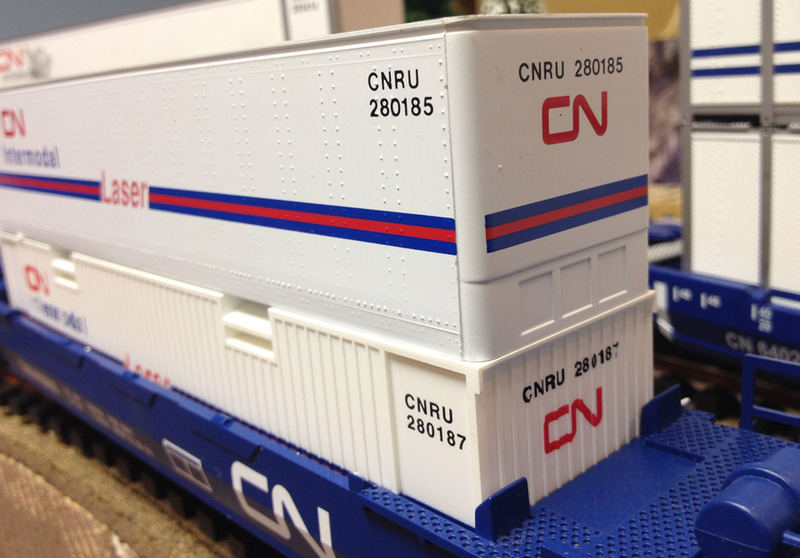 This unique factory error shows one of the four containers (280187) missing its CN logo on the forward panel. It appears at least 1 (mine) and a small number of others didn’t get stamped. 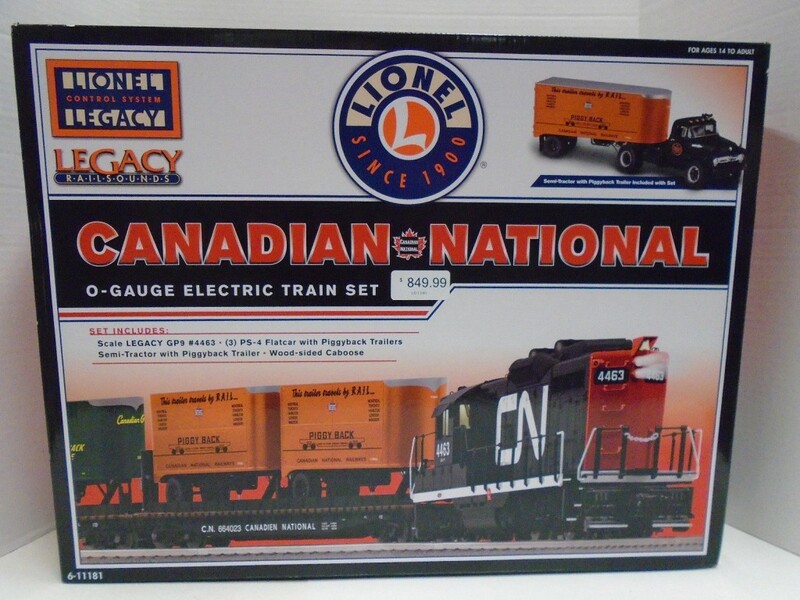 Lionel took Canadian National for a ride again with the release of their 2012 Signature Catalog. 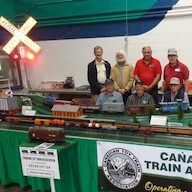 Canadian toy train fans were excited to see, on page 8-9, a beautiful O scale CN GP-9, with Legacy Command Control, leading colorful GP-9 piggyback set 6-11181, featuring 3 unique flatcars with a pair of Piggyback trailers on each, trailed by a CN Wood-sided caboose. Things sure look great on the right side of the train, as you wave to the engineer going by. On the other side of the train, the white trailers with the ‘Canadian National’ lettering has the words reversed! The decoration and lettering displays ‘National Canadian’ perfectly. We think the entire production run is a goof. Lionel product 6-11181 sure looks great in the catalog. And on the right side.